Pax Christi USA is astonished, embarrassed, and deeply disturbed by the recent vile treatment of immigrants and the inhumane policies that have been put in place in an attempt to curb and to punish undocumented immigrants. Actions by the current presidential administration include: Immigration Customs Enforcement (ICE) lured workers into captivity with donuts, a nursing child was separated from its mother, children who have been separated from parents are being held inhumanely away from their parents, and Attorney General Jeff Sessions will no longer grant asylum for victims of domestic abuse or gang violence. The detention centers are concentration camps, separating children from their parents and keeping children indoors for 22 hours a day is torture, and rejecting asylum seekers is a death sentence. Immigrants are human beings. Never is it acceptable to separate families and keep parents and children from knowing where the other is being detained. Also disconcerting are the references to Scripture to excuse the fact that the U.S. has currently lost its moral compass. This is not the America PCUSA believes in or wants, and it is almost difficult to believe this vile treatment is real. These news stories feel like pages out of the dystopian novel, The Handmaid’s Tale. But it is real, and the human rights violations are continuing. Even the UN Commissioner on Human Rights has rebuked the United States for these policies. PCUSA members need to take strong action. It is time to protest, write Congress, write the president, stand outside the detention centers and local ICE offices, and demand that these affronts to humankind stop immediately. One significant benefit of all this evil might be our Bishops awakening from their spiritual slumber, at least enough to realize they cannot any more “automatically” sign off on Republican party actions than they now can on the other (Democratic) major party’s. All of which may be a wonderful providential opportunity for the American Solidarity Party. Proverbs 21:30 and Romans 8:28 certainly apply here. I’m ashamed to call myself an American. This reminds me of tactics used by a totalitarian state, not a democracy. This must stop. Parents can not be separated from their children. Our church leader must speak out forcefully against this inhuman treatment. It is truly appalling! What is even more egregious is the selective reference to our sacred scriptures. What about “You shall treat the alien who resides with you no differently than the native born among you; have the same love for him as for yourself: for you too were once aliens in the land of Egypt” Leviticus 19:33-34. Christ argued with the Legalists about unjust laws. The Beatitudes were given to us by Christ, so that we would fulfill the Spirit of the laws: not the letter of the law. Obviously Mr. Sessions and Ms. Sanders ignore these moral mandates. Thank you Pax Christi for your powerful statement. Mary Geraghty, I completely AGREE with you here. Especially your point about the hypocrisy and dishonesty of Sessions and Sanders…and therefore by extension this entire Trump administration. Hypocrisy on stilts, a term used to describe the Bush II administration, applies much more to this administration than to that. For SHAME! For TOTALLY SHAME. Isaiah 29:13; Matthew 15:8; Mark 7:6 certainly apply. Only unresolved question in my mind: how long can this nonsense continue without major, frightful consequences which in themselves are quite logical and necessary. Galatians 6:7 applies. Imagine Attorney Jeff Sessions saying we are separating parents from children. WE are robbing children, We are acting without conscience. The children are not learning a lesson, can we the USA learn a lesson. People need help. Immigrants need help. We all of us, have three times more than we need. We of the USA are Christian let’s show it. This is evil at its worst. And diabolical to use Scripture to support these outrageous public sins. This is destroying families, mocking humanity and promoting immorality. Our fake leaders are leaning toward dictatorship asking for the so-called love and loyalty that Trump touted with North Korea. May God forgive us all. I think we all need to respond to this action. I am willing and able to help in some way. I want to do more than send money. Thank you for taking a stand and for keeping “Love your neighbor” in the fore front of our lives. Since when does a new U.S. law that orders kidnapping immigrant children take precedence over God’s call as cited in Scripture such as Love your neighbor as yourself! Do unto others as you would have them do unto you! Welcome the strangers! etc, etc.Taking children from their parents is kidnapping. No U.S, law can change that fact. No U.S. law can mandate criminal acts. Having worked with children who have experienced trauma for many decades, I am deeply sad about the separation of children from their parents. This is truly devastating to both the children and their parents. We can’t forget our most vulnerable. explodes into the kin-dom of God where we all, not just biological families, are truly one family. I appreciate Pax Christi’s suggestion to do such things as protest, write Congress, write the president,etc. We do not want to be silent because look what happened in Germany! It is a shameful and in human action. Agree entirely with Pax Christi’s stand and will phone our Representative and Senators to hopefully enhance their consciences. American leaders have lost their way. The last week for negotiating a global compact for safe, orderly and regular migration will happen in the UN starting July 9. The US withdrew from these negotiations at the very beginning. What is happening to people at the border is unconscionable. We need to organize as churches and as people of good will to say NO! Government’s role is to protect people not just citizens but all people. Hence the need for the Global compacts – there is also one on REFUGEES. This inhumane treatment deserves vigorous counter-protest: Are there any plans for such? 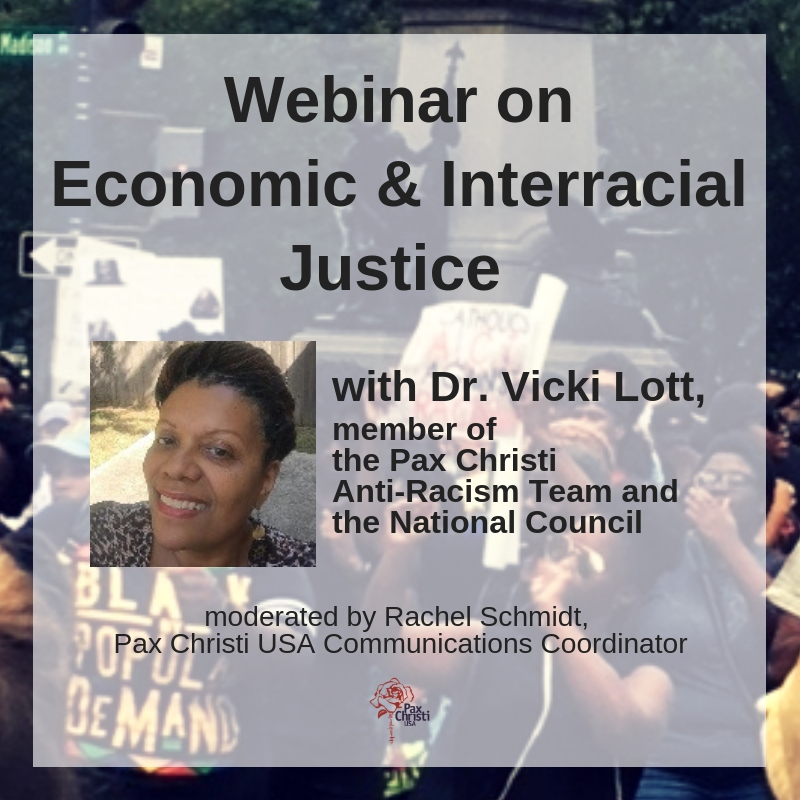 Thank you Pax Christi for all this organization has done to inform our members and the wider communities on many urgent issues effecting the nation, it’s citizens, and global populations. To treat children and families in such a manner should not be the character of this nation. We all have to take actions against this horrible violence. Be it contacting our elected officials or taking a stand at these detention centers, and being present with the people coming to this country who have fled violence and poverty in their own homelands. We are called to do no less as I continue my prayer of justice and peace for all of God’s beloved children. Let us stand together as Americans and defeat this inhmane action towards the most vulnerable. Follow the money ! Who is making $ with the establishment of these centers for the children? The children are separated from their parents by ICE officials who will take them for a bath! That story sounds familiar! First they came for immigrant and I wasn’t one! We must stand together to stop this NOW! My heart cries! My spirit is shocked and I am reminded of the Nazi camps. We call ourselves Americans??? An embarassment to what we stand for in our country. It is terrible enough what is happening to the adults looking for a safe place BUT CHILDREN ?????? Agreed! But you responded more elegantly, Carole! Horrendous acts on the part of our government. Is this the way we want the world to see us as AMERICANS? Please quote the Bible in context and look at the BEATITUDES that call Christians to action and love! I am saddened to hear these horrendous stories guided by the abuse of Scripture. May hearts be changed to compassion and welcome. Where in the New Testament does it say that blessed are the cruel? Our church leaders seem to be missing. I am so ashamed of the leaders and workers who in our name are actively and deliberately hurting little children. I will call my Representative and Senator. Thank you, Pax Christi !